Finally here from FG their FG Monster 4x4 Belt Driven System. Here it is!! Finally Here!! The FG Baja 4x4 Kit. 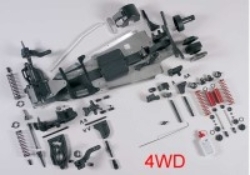 Comes with everything you need to make your FG Baja 2wd a 4x4 belt driven system. Yes Make your FG Leopard 4x4 with this kit. (Special Order) Please allow up to 2 weeks for delivery.